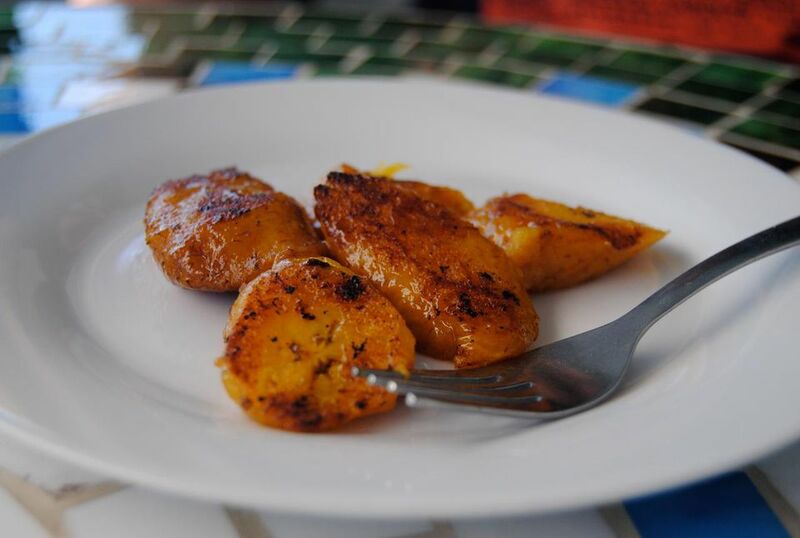 Fried ripe plantains are served with meals mainly as a side dish or as a snack. Throughout the Caribbean and Spanish-speaking countries, fried ripe plantains are common. For example, in the South American country of Guyana, fried ripe plantains are traditionally served with the national dish, cook-up rice (rice, beans, and meat cooked with coconut milk). Cooking bananas, or plantains, come in two forms: unripe, or green plantains, and ripe plantains. They are a staple food for developing countries throughout Africa, Southeast Asia, the Pacific Islands, the Caribbean, Central, and South America. Fried ripe plantains are made to go along with any dish, and in many cases, it is made and eaten daily. As the plantain ripens, it becomes sweeter and its color changes from green to yellow to black, just like bananas that you eat raw. Green plantains are firm and starchy and resemble potatoes in flavor. Yellow plantains are softer and starchy yet sweet. Extremely ripe plantains have softer, deep yellow pulp that is much sweeter. Plantains of all varieties can be prepared in every way imaginable: steamed, boiled, grilled, baked, or fried. There are even two ways to fry plantains, as chunky, bite-sized pieces or thinly sliced, like chips. Frying ripe plantains are straightforward, however, before attempting to make this dish, it is important to understand what is happening during the cooking process in order to execute the dish properly. Plantains go through various stages of ripeness. The varying degrees of ripeness is evidenced by the changing color of the plantain's skin. For excellent fried ripe plantains, you will want to choose a plantain with skin that is dull yellow with patches of black or completely black—when a plantain is at its peak of ripeness. A plantain at its peak of ripeness has exchanged all of its starch for natural sugars; frying it at this stage of full ripeness coaxes all the sugar to the surface, and browns easily. Browning yields tasty caramelization notes. You will note that people opt to cut the ripe plantains diagonally (on a bias) since it provides a larger cooking surface for caramelization. Apart from choosing a plantain at its proper stage of ripeness, there are three other important things to take into consideration when frying ripe plantains. Frying Pan. It is probably best to use a non-stick skillet as this will aid in the easy release of the cooked plantain from the pan since sugar burns quickly and sticks. Cooking Oil. Your choice of oil is another important consideration. You might want to use a neutral tasting oil such as canola or vegetable oil. The amount of oil used for frying should be just enough to coat the bottom of the pan. Too much oil will cause the plantains to soak up the oil resulting in soggy plantains. After frying each batch, drizzle additional oil if needed (or top with butter). Heat Level. Perhaps the most important factor when cooking plantains is the heat level. Use medium heat to fry plantains. You may have to lower the heat depending on the size of your stove burner and pan. If your heat level is too high, the plantains will burn or brown too quickly. If they brown too quickly, the inside will not cook through. You want an even cook on the plantains.